Like millions of others around the world last night, I tuned in to watch the Opening Ceremony of the London 2012 Olympic Games. It was the first time in months that I’ve sat in front of the TV for four solid hours, but every second was worth it. 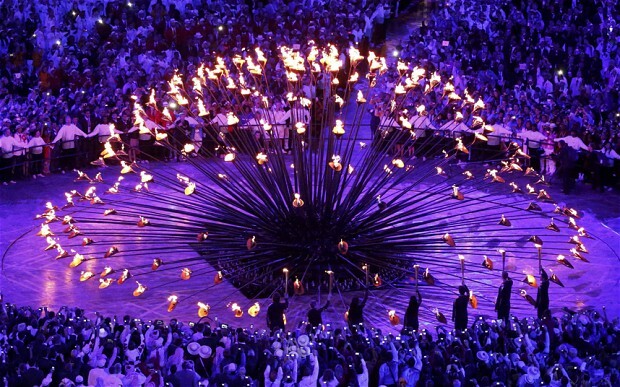 From the a cappella opening lines of Jerusalem to the beautiful convergence of 204 flaming copper petals to create the Olympic cauldron, the final result of Danny Boyle’s creative vision was, in a word, spectacular. The Ceremony truly encompassed the best of our ‘Isles of Wonder’, with a very British sense of humour. Whoever came up with the idea of Mr Bean doing Chariots of Fire deserves an Olympic medal for comedic genius. The industrial chimney stacks rising into the stadium gave an awesome sense of anticipation and Her Majesty greeting James Bond was another highlight. The only aspects of the Ceremony that didn’t really do it for me were the text messages that kept popping up during the section celebrating British music: I’d have rather just listened and enjoyed the dance routines. Having said that, it was undoubtedly an event ‘for everyone’ and I can only jealously imagine what the atmosphere in London must have been like. I’m not sure it’s within my lexical ability to satisfactorily describe the scale and spectacle of the five Olympic rings joining above the Stadium and showering golden fire towards the floor below, but suffice to say that if you did miss the Ceremony last night, you need to get on iPlayer now. I doubt there’ll ever be another occasion that sees Lord Voldemort, Mary Poppins and Isambard Kingdom Brunel in the same place, after all. Hats off to everyone involved, from the huge cast to the masters of technical wizardry behind the scenes. ‘The Greatest Show on Earth’ has well and truly begun and Great Britain has done itself proud.